Let me just raise a few items, Mr. Secretary. The first one: just a reminder to the predominantly Muslim-led governments in this world that here is yet another example that the United States leads the way for the creation of a predominantly Muslim country in the very heart of Europe. This should be noted by both responsible leaders of Islamic governments, such as Indonesia, and also for jihadists of all color and hue. The United States’ principles are universal, and in this instance, the United States stands foursquare for the creation of an overwhelmingly Muslim country in the very heart of Europe. There is no hint of "principle" anywhere here. It's pure politics. Like many others before him, Lantos is trying to appease the jihadists (he actually uses the term!) by throwing them a bone in the Balkans. It is interesting, to say the least, that Albanians suddenly become Muslims when it's convenient to make this sort of "argument," but quickly become "secular" and "moderate" when critics try to point out the systematic destruction of Serb churches and construction of Saudi mosques. Same with the so-called Bosniaks - one day they are "moderate" and "secular," the next they are "Muslims in the heart of Europe." And please - what heart? Kosovo is the historical heartland of Serbia, and the Balkans in general is very much at the periphery of Europe. Or was Lantos maybe thinking of the Netherlands? In any case, the whole effort to placate the world's Muslims by supporting Islamic causes in the Balkans has been proven ineffective repeatedly; not just in the countries like Indonesia, but among the Balkans Muslims as well. For example, far from appreciating Western help in claiming a state in the "heart of Europe," the Bosnian Muslims have come to believe that was the very least the West owed them, and have engaged in mockery of Western assistance. Certainly, Pristina may have streets named after Bill Clinton and Madeleine Albright now, and Lantos and Nicholas Burns may exchange friendly quips about how their own names, and that of George W. Bush, ought to be among them. But already the Albanians of Kosovo believe that independence is the very least they are due, and don't hesitate to attack UN officials or NATO troops that are perceived to stand in the way. So much for the gratitude of your Muslim "allies," Mr. Lantos. When the Izetbegovic regime picked a fight with the Bosnian Serbs fifteen years ago (April 6, 1992), one of the immediate results was a division of Sarajevo with roadblocks and barricades, with the part of the city controlled by Muslim militias effectively cut off from the rest of the country. Most stores were looted within weeks, courtesy of crime overlords who declared themselves "defenders" of the city - although they had copious help from local residents who figured (and correctly) that this was all the food they would see for a while. Food began arriving into the city in June, when the airport re-opened under UN management. Thus began the Sarajevo airlift, which lasted longer than the Berlin one. Someone somewhere probably has a tally of all the food, medicine, blankets and plastic sheeting that UNHCR delivered to Sarajevo, and Bosnia in general. I can only say with the certainty of someone who's been there throughout the war that this aid kept people alive who would have otherwise starved. And not only civilians - because as soon as the food and supplies started arriving, the government set up an "Agency for reception and distribution" of aid, which would skim 60% or more of the rations for use by the government and the military. One can only imagine the dire predicament of civilians trapped in wartime Sarajevo when MREs were considered gourmet food, usually sprinkled on top of rice, pasta or - on those rare days - beans. One of the staples of humanitarian aid rations was Icar - canned beef from somewhere in the EU which looked rather vile. Well, as war and propaganda went on, soon the people inside the Muslim portion of Sarajevo began to grow a sense of entitlement. The food was nothing more than the world "owed" us, for failing to defend us from "aggression" and "genocide." How dared they send us ratty gray blankets, or vitaminized biscuits from 1968, pulled from stocks never used in Vietnam? Didn't they know we were Europeans, used to Italian shoes and German cars? The outrage! Fifteen years after the "international community" saved us from starvation just in time, Reuters reports that an art organization has sponsored a monument to Icar beef (Reuters photo below). "To the international community, the grateful citizens of Sarajevo," reads the inscription on the pedestal holding up the giant Icar can. "It's witty, ironic and artistic," says Dunja Blazevic from the Center for Contemporary Art, which is behind the sculpture. The popular urban myth from the war, recycled by Blazevic in her statement to Reuters, is that Icar beef was so vile even cats and dogs refused to eat it. It's certainly possible. But I've traveled a bit since, and Icar is hardly worse than what they serve in school cafeterias or fast-food places in the U.S.
No one in the world had the slightest shred of obligation or duty to send anything to the people of Bosnia, who democratically elected politicians that led the country into civil war. The responsibility for supplying and defending the civilian population was squarely on the government that declared independence - and that government failed at everything a government is supposed to do. Miserably. To cover that up, it constantly blamed the "international community." To the present day, hundreds of thousands of people in Bosnia believe "the world" had failed them, and that the West owes them something. Thus the Icar monument. "Hey foreigners, how dare you send us non-gourmet food? We are the righteous victims, didn't you know?" I wonder if those ingrates who made the sculpture, as well as those who will walk past it with an approving snicker, will ever realize that without that help, without those very cans of grade-Q beef, few of them would still be alive? The world owes us nothing. And we owe ourselves the truth. Last week in Balkan Express, I challenged the Albanian argumentum ad atrocitas for the independence of Kosovo - the notion that, because of "ethnic cleansing" and atrocities allegedly perpetrated by the army and the police, Serbia has somehow "forfeited" the right to this province. Much as it has been the case with reported death tolls in Bosnia, the number most often cited in wire reports (10,000 dead Albanian civilians) is a complete fabrication. This is not to deny that crimes against civilians happened; the Yugoslav Army has actually prosecuted a number of its troops for violating the laws and customs of war. But the notion of widespread, state-ordered or sanctioned atrocities against Albanian civilians is simply not supported by evidence. There was no "Operation Horseshoe," much as the NATO apologist behind that Wikipedia page would hate to admit it. So, do I deny that 800,000 (or however many) Albanians were expelled from Kosovo by Serbs? Absolutely. I don't deny that these people were displaced; that would be challenging physical reality, which happens to be the purview of the Empire. I do, however, question the claim they were deported by the police and the military. And indeed, some may have been. But all of them? We invite you to temporarily evacuate the endangered territories of the Republic of Kosova, due to the ongoing major offensive by the Serbian occupation forces. We cannot protect you, and neither can the Kosova Liberation Army. We need to save our people and our lives. Therefore, proceed immediately towards Albania and Macedonia. We have asked NATO to help us in our struggle against the Serb occupation forces, because these forces have launched a great offensive in the entire territory of the republic of Kosova. We are getting this help, but the KLA is not able to fully resist the offensive and defend the Albanian people. Therefore we call on all Albanians who face danger from the Serb occupation troops to evacuate to Albania and Macedonia. Now, let's see. It's April 1999. 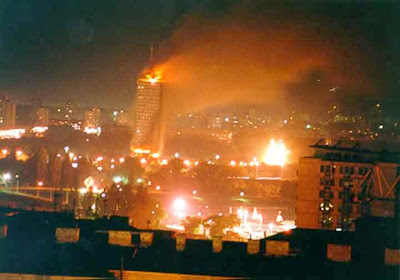 NATO has been bombing Serbia for a week, on the pretext of imposing the Rambouillet "agreement" on the government in Belgrade. It's become clear that Belgrade would not surrender. The KLA - which had recovered from defeat in the fall of 1998, thanks to the intervention of Richard Holbrooke and the subsequent support from the KVM - was being routed by the Serb police and the Yugoslav military, deployed to the province to stop the NATO invasion. In other words, things were going rather badly for the Alliance. All of a sudden, throngs of Albanian refugees pour over the borders into Albania and Macedonia, into camps set up by the KLA and staffed by KLA cadres, who are more than happy to guide the correspondents from NATO countries and OSCE reporters around, collecting testimonies and listening to sob stories. CNN can now show photos of crying Albanian women. The German government, engaged in open war for the first time since 1945, can now bolster the NATO cause by claiming the existence of a secret Serb plan to "ethnically cleanse" Kosovo Albanians. Macedonia is overwhelmed, and destabilized (which would come in very handy two years later). So, Albanians were transformed from separatist terrorists (KLA) to innocent victims of evil Serbs. NATO was provided a justification for its illegal war that sounded much better than the imposition of a fake peace plan, or a shoddily fabricated massacre. 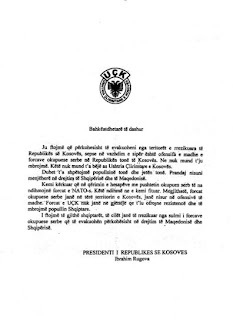 And the KLA was able to assume the role of "protector" to Albanian refugees, thus becoming the leading force among the separatists (who had until then supported Rugova). What an utterly amazing set of "coincidences," don't you think?